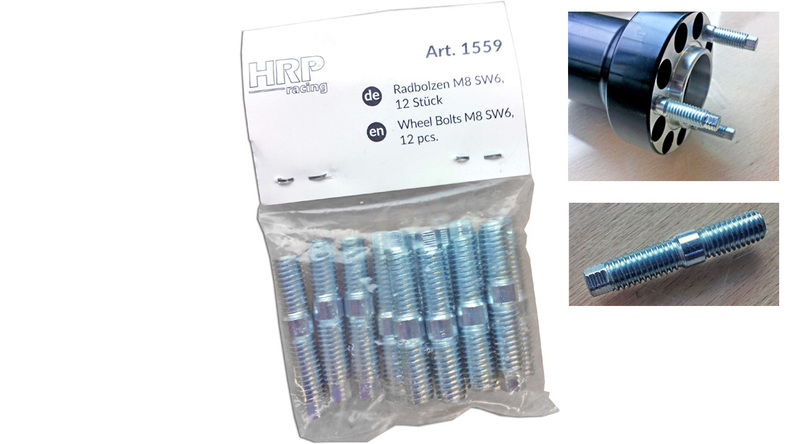 Mach1 Kart / HRP presents their new stud bolts made of special steel fitting into all karting wheel hubs. The wheel nut fits easier on the bolts and cannot cant any more. This is an outstanding feature especially if you work with power tools. You can safe several seconds per tyre change on endurance races. On sprint races you gain on assembly safety. This is the dream of every race mechanic. The special zinc coating prevents galling and support the nut. If you ever have to change the bolts, this will be a done in seconds: Take out and screw in the bolt with the integrated allen head (SW6) – without any special tools. The stability of the rim/hub connection is significantly improved due to the use of a wider centering piece.